In this work, the authors study the distribution of floating debris in the northern Iberian waters. Field data and model results show high concentrations of floating debris in the Bay of Biscay. 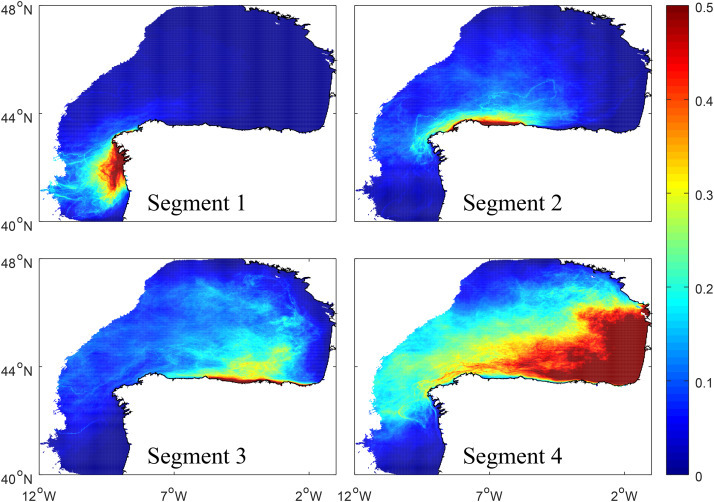 In this work, the Regional Ocean Modelling System (ROMS), in conjunction with a particle-tracking model were used. Longer residence times were observed in the south-eastern Bay of Biscay, where the concentration of floating debris would be, on average, 2.1 times higher than in the north-western Iberian coastal waters, and 3.6 times higher when considering only the winter months. The analysis also suggests the existence of a seasonal influx of floating debris into the south-eastern Bay of Biscay, which would be greater during the winter. Both results – long residence time and influx of floating debris – support the hypothesis that the Bay of Biscay can be regarded as an accumulation zone of floating debris. Previous: Previous post: CleanAtlantic Survey – your participation is needed!